Ursula is the newest member of staff and a long time friend of Roisin’s! She has a quirky personality and is gently inspiring, often arriving for work after running 10 miles or more! She is always willing to give a hand or do an extra few hours work to dig out her co-workers; being mum to three of the combined staff's 21 children – she knows what it’s like sometimes! She has a very unique taste in fabric and falls in love with all the “crazy” prints that we get in the shop! Karen was the first member of staff, having jumped in off the spot one day to help Roisin at a trade show. She always has a smile on her face making everyone feel comfortable and happy to visit the shop! Having many creative skills such as her own cake company for a few years as well as a being a knitter and a quilter, she’s well equipped to answer questions in the shop! Naomi doesn’t work here – well, she doesn’t consider it work. How can it be when she’s in the place where everyone shares her hobby and she’s surrounded by bolts and bolts of pretty fabric? She ended up here by accident after checking the shop’s Facebook page every day and realising Roisin was too busy to update and let everyone know about the new deliveries.......so she said “please let me help”, then she held the fort in the shop one Saturday, then it became once a week and lately she doesn’t leave! Now, she works in the shop, teaches on occasion and now manages the webshop.....and somehow hopes to fit in learning to crochet if her brain will allow her to store anything that’s not sewing related! Eva arrived at the shop with a wealth of experience having previously run her own quilting shop in Galway City. She was appointed Shop Manager and has quickly shown her strengths dealing with customers and suppliers alike and keeping some kind of control on the chaos. She’s well liked by our visitors in the shop who value her opinion and advice. She’s a whizz at measurements and will work out your wadding and backing requirements super fast! Her sensible side combined with Roisin's giddiness make for a good balance! Leader of the pack is Roisin – Owner and GSW (General Super Woman). She has so many ideas spilling out of her that we’re pretty sure that’s where her curls came from – overspill! That phrase “ask a busy woman” proves true with Roisin, she doesn’t know what a day off is and doesn’t seem to be any the worse for it – she works day and night and has a soft spot for every one of the 70 women who attend classes as well as all of her customers. She retains knowledge like no other, remembering each and every project that her students are working on, knowing exactly what to recommend next and always thinking ahead. 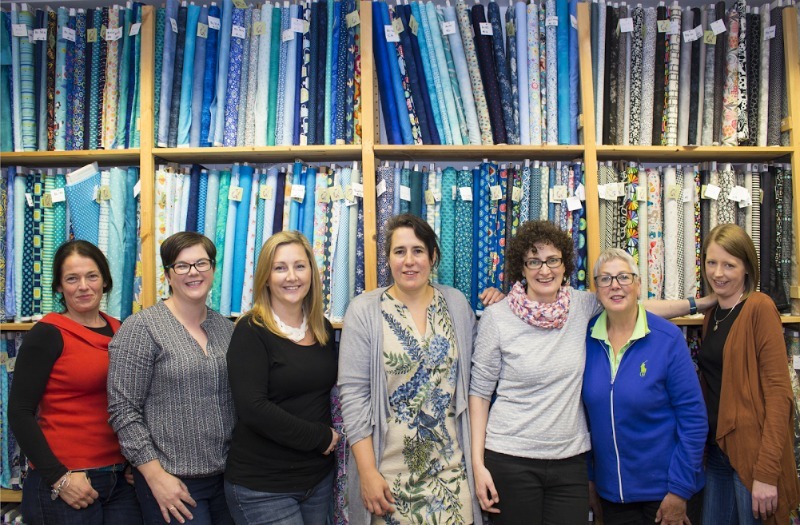 Her business brain has seen the shop grow from an idea (“I might start a patchwork and quilting class in the back of my husband’s TV shop”) to a thriving business that has overtaken the full building. In the past year, she has pulled off the near-impossible and secured us a top of the range long-arm quilting machine providing a much needed service to the growing number of quilters locally and across the country! And now, the webshop – finally open, answering the requests of our Facebook followers internationally! We tentatively await any new curls springing up on Roisin’s head and with them new ideas, plans and excitement! Her enthusiasm is infectious....so whatever happens we’re ready to roll with it! Nora is the real Irish Mammy of the shop. Being Roisin's real-life Mammy, she is ever helpful, always waiting in the wings for when you just need your Mammy to help out. Her quiet manner is backed up by her extensive knowledge of quilting. A real asset to the shop. She will teach a class, she will cut fat quarters, wherever she is needed Nora is there! Sandra is our crochet teacher, a local lass who loves nothing more than to sit with yarn in hand and hook the hours away. Over the years she has studied crochet in it's different forms and continues to do so now on an international level. So needless to say, we think she is just the best! Crochet is now one of the only crafts left in the world that can only be made by hand. Sandra’s goal is to teach and promote this unique art to as many as possible when and where she can and of course have lots of fun in the process. In Sandra's world "every day is a good day to crochet".